Former Wigan winger Martin Offiah says beating the Sydney Roosters in Australia on Saturday would be this Warriors side's "greatest achievement". The Warriors won the Super League last season to earn the right to face Trent Robinson's men at Sydney's Allianz Stadium in the World Club Challenge. Offiah, 47, played when the competition was last held down under in 1994. "It will be a baptism of fire and something that will make or break this Wigan side," he told BBC Sport. The competition has been staged in England since Graeme West's Wigan side defeated Brisbane Broncos 20 years ago. The following 15 matches have seen the National Rugby League champions travel to Britain to face the Super League winners. Offiah, the third most prolific rugby league try scorer of all time, says Wigan need a similar performance to that which his side produced if they are to win. "Fear motivated us that night, fear that we were going to get absolutely trounced by an Australian team," explained Offiah. "That is something we did not want to happen. It was like going into battle, we were going to put our bodies on the line. "The players know they will be up against it. Not only will a win be their greatest achievement, it will be on a par with what was achieved in 1994." 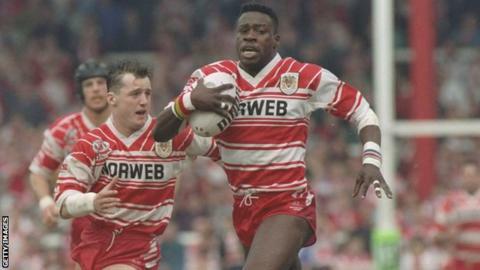 Offiah won five league titles, four Challenge Cups and the World Club Challenge during his five seasons with Wigan, having joined from Widnes in 1992 for a world record fee of £440,000. "It was one if the highlights of my life. There are certain things in rugby that you achieve which stand out and that was a great night, a pleasure to be involved in, even though I didn't score. "Playing against Brisbane Broncos in their height, they were the team to beat and to beat them in their own back yard was something that will live with me, the rest of the players in the team and Wigan fans too. "We didn't give ourselves a chance, I don't think anyone thought we would win that game." He feels making the trip early to the southern hemisphere was a wise move, having started the new Super League season with a defeat against Huddersfield. "English teams have had a lot of success in the World Club Challenge over the last decade or so but it has been played on our terms, on our soil, in our climate," he said. "Wigan will be out there in Australia in different surroundings where nothing is familiar. The heat, the pitch, the grass, the ball, everything will be foreign to them. "That is why it is important they went out there earlier, had a warm-up game to get acclimatised and get the jetlag out of their system. "You have to get your sleep right; it is all about focus and preparation and getting into the right mindset but still staying relaxed. They can't get too uptight; if they do that, they will not be able to do the natural things."